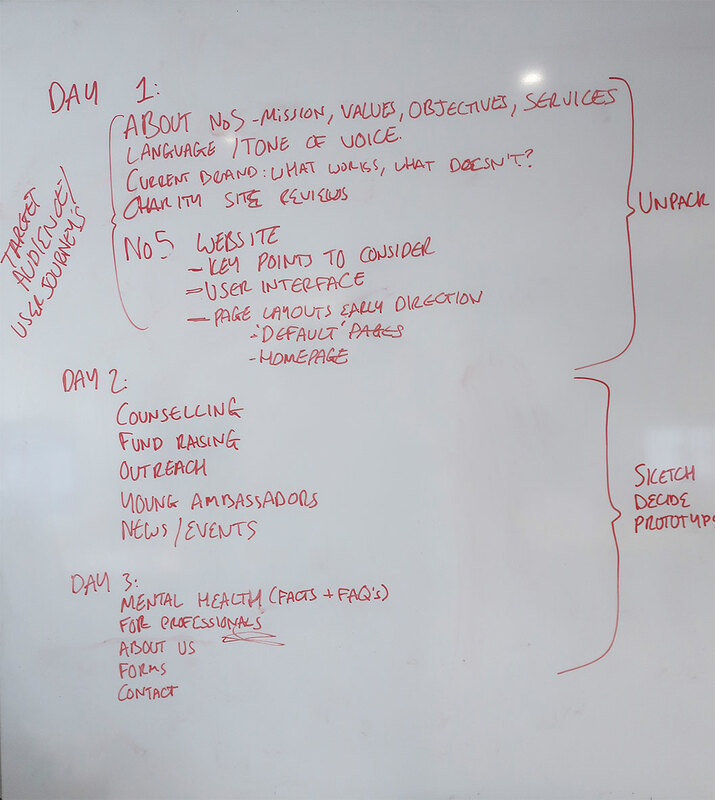 We turned up the heat even further recently and introduced our design sprint process with a client in participation, for a week of heavy lifting and design thinking (the lifting being metaphorical). A design sprint is intended for tackling a myriad of design and business challenges. It maximises productivity by combining teamwork, strategy, creative thinking and prototyping, allowing the generation of unique solutions to problems in a short period of time. 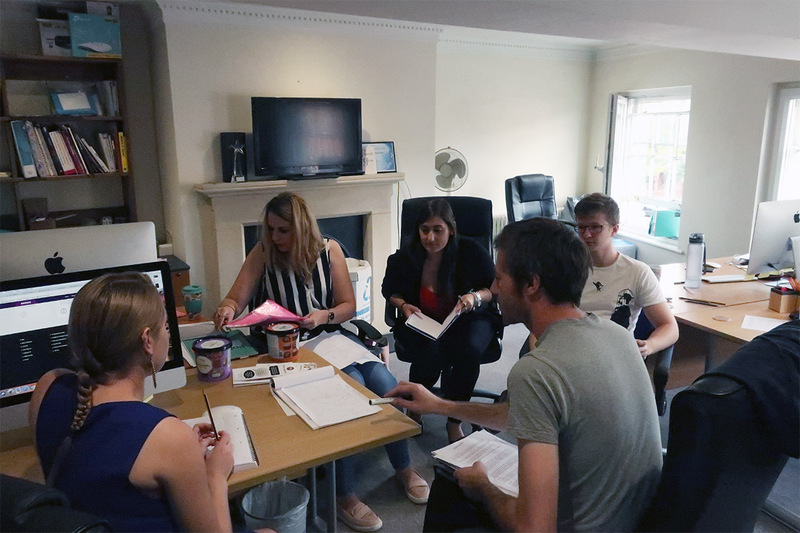 For this sprint our client is local charity No5, who works with local authorities and the wider community to offer counselling and support to young people in Reading. 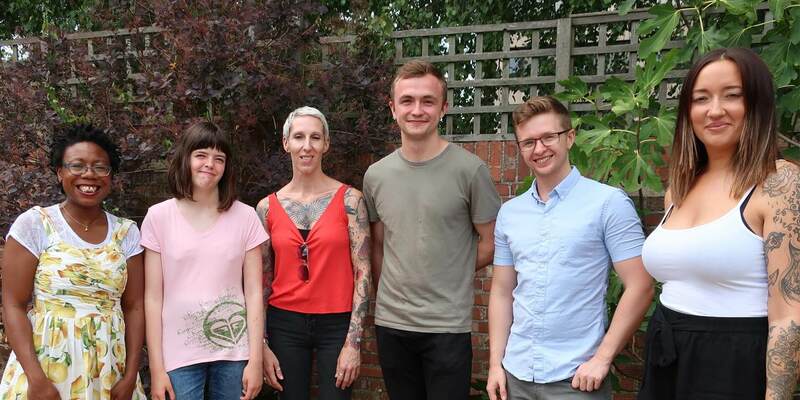 Alongside core service provisions, their work within local schools and businesses has them educating and building understanding of the realities of wellbeing and mental health. Being based in Reading for over 47 years and having a driven team behind them, No5 made it an exciting week worthy of the dedication a process like this requires. 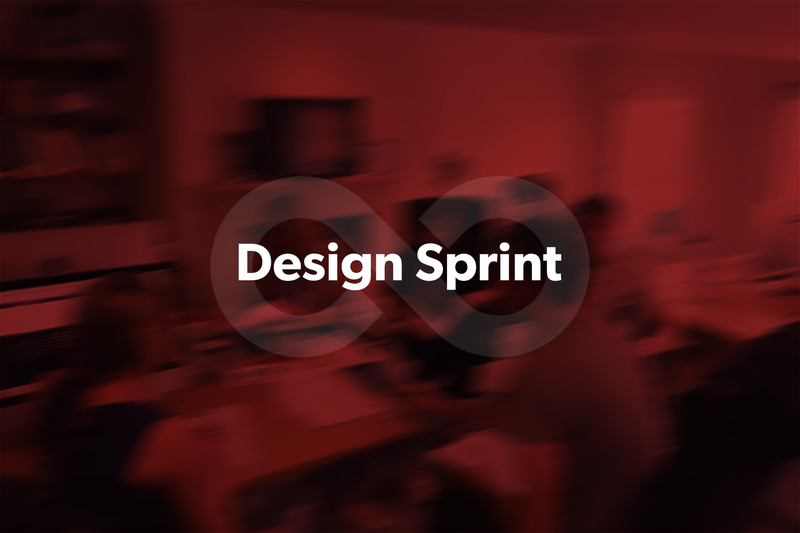 A design sprint is a feedback loop that can be broken down into managed stages. All relevant information is gathered, parameters are set, scope is gauged and a thorough understanding of what the end goals and its associated reality are. Research is shared with the team to bring everyone involved in the project to the same level of understanding, to share initial ideas and thoughts and ensure everyone is heading in the same direction. Each person involved in the project is tasked with individually generating as many detailed solutions to the problems as possible. 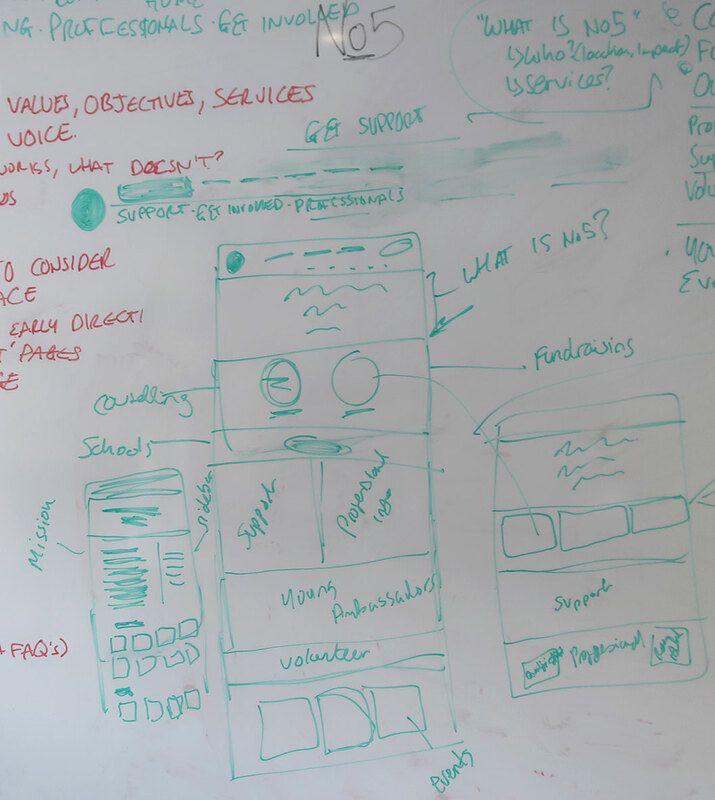 It may involve mind mapping, personal research or sketching concepts and wireframes. The team reconvenes and pools all their ideas in order to decide which will be taken forward to prototype. Encompasses both design and development work involved in creating a working solution to the original problem. In this stage a testing schedule will be completed. Issues are identified and the experience is further evaluated. Once the product has gone through its iterations, improvements or changes and any identified bugs have been resolved, the product can go onto its next stage. We usually like to dedicate 40 minutes per session but this is flexible. You can undergo the above process in isolation or in a team, it’s important to take note just how agile this process is. You can start anywhere, get feedback everywhere and never stop learning and ideating towards the ultimate end product, resources allowing! Left: Plan of action for No5’s Design Sprint / Right: Going through the wireframing process with our team and client. Having the client present and “unpacking” all our previous understanding allowed for an even deeper familiarity with their organisation and their audiences’ needs. At the same time we looked to evolve their brand whilst offering additional stability and support to their staff, volunteers, and the young people of Reading. Responsible for the structure, direction and unpacking whilst highlighting strengths and weaknesses. The Leader evaluates and sets realistic goals, manages expectations and ensures successful delivery of the sprint. The teams will ideate, critique and prototype towards our end goals. They may have specific skill sets (artist, developer, copywriter etc.) as well as unique perspectives that will help produce an innovative end product. Those who have invested in the project. They hold key information and expertise outside of the team, and have specific needs that have to be understood and accounted for. Those who will use, view or otherwise come into contact with our product. Understanding and working for your audience is a core facilitator of a successful product and everything we do should be with our target audiences in mind. Due to the open-ended nature of the process, unique challenges present themselves for debate that extend far beyond initial considerations, which were already the result of a great deal of thinking. This allows us to arrive at well reasoned conclusions that can be built on further, and that give the basis for more prosperous insights down the line. The design sprint process is a great collaboration tool to maximise team productivity for any project, no matter the size. It gives everyone involved an in-depth understanding of the tasks at hand and foresight to come up with solutions for complicated problems within a short period of time. Hopefully this article gives you a good start toward applying it for your next great creative or business challenge. Red Balloon and No5 get to work. 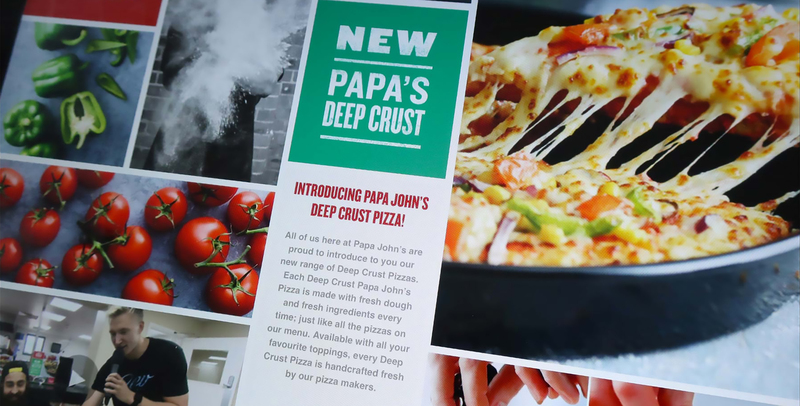 We assist brands deliver on their key challenges through design and technology. We’d love to hear about yours. Get in touch to discuss working together. Bill leads the team at Red Balloon with over 15 years experience delivering web design and branding project for clients worldwide.